Adapting to the Premier Division proved too tough a task for Morley Town, their first season since promotion ending in the drop after defeat to Stanley United. Town embarked on a promising mid-season run but a sluggish start and lacklustre end condemned them to a return to the Championship at the first attempt. Sticking with the players that earned them promotion, defensive shortcomings were all too often exposed and the lack of a specialist keeper left skipper Marc Haley standing in. But there were promising performances along the way, including striker Ryan Hartley excelling himself in the top flight and ending with a healthy haul of 16 goals. A final-day meeting with second-placed Stanley always looked a tough one, and they trailed 2-1 at the interval with Joe Childs and Rob Lee on target. Elliott Foster converted the penalty that reduced the arrears, only for a timely strike from ‘Rep XI’ man Josh Whiteley to make the lead unassailable. The matter of relegation was far from their thoughts as they enjoyed a pint in the sun at the Carriers Arms with their opponents, ending the season strongly with four unbeaten. Alwoodley and Farsley Celtic Juniors are others going out on a high, wins over St Nicholas and Stanningley strengthening their grip on top-five finishes. WRCFA Trophy finalists Alwoodley cruised to a 5-1 triumph over bottom side Nick’s, Jimmy Willmoth bagging a treble and Dino Mulavdic a brace. Farsley’s title defence is finishing with a flourish, a fifth win in six sealed by Louis Surtees and Josh Maskill at Stanningley. Grangefield Old Boys still have two opportunities to usurp Celtic into fifth, but were outfought by Athletico in a 3-2 weekend defeat. The Bradford side have been a breath of fresh air in the Premier Division, an unrelentingly attacking approach again paying off with top scorer Mohammed Qasim at the double. Meanwhile, what should have been a battle royale between first and third ended in a funereal stalemate between champions Drighlington and Leeds Medics. 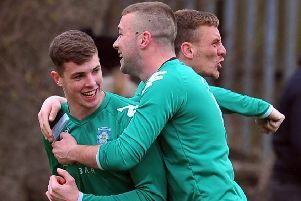 One of the Championship’s top sides would love to emulate Drig’s exceptional achievement of lifting the title in their first season in the league. The second automatic promotion place is still up for grabs, St Bede’s needing to beat basement boys Thornesians last night to stand a chance of stealing in. Either way, if Gildersome Spurs beat Calverley United tonight at Calverley Park they will join Horsforth St Margaret’s Sunday in the top flight next term. Bede’s 4-0 defeat of Beeston St Anthony’s saw Adeeb Jawad and James Gilmartin ensure promotion went down to the final week of the campaign. Aiden Gilligan struck late to ensure Horsforth’s superb season ended in victory, a 2-1 success over Leeds Medics Reserves. Gilligan gave his side an early lead with a controlled finish from the edge of the box, only for the Marflitt Trophy finalists to peg them back with Nick Maxwell’s close-range equaliser at the near post. Medics deserved at least a point, Connor Walsh striking the post in the second half, but Gilligan beat two men to head home a winner from Jamie Douglas’ corner. At the bottom, already-relegated Thornesians shared a sizzling 5-5 draw with fellow strugglers Wortley who secured safety in the final throes of the season. Cody Doyle hit four and Josh Procter netted for the third-bottom side, only two points above doomed Collingham Juniors but have a further game to play. Andrew Waterson scored twice for Thornesians, Ryan Dobson, Phil Hayes and James Wootton also on the scoresheet. There’s plenty still to be decided in Division One, where Idle have a chance of promotion. Their 4-0 triumph over mid-table Collegians left them needing Leeds City Old Boys to collect fewer than four points in their remaining two games to hold on to second. Aaron Irving fired in two to secure their 15th league victory of the season, allied to efforts from Carl Dawson and Tom Simonett. An 11-1 drubbing of Leeds Medics III suggests Leeds City won’t waste opportunities to turn the screw, and they still have the reverse Medics fixture to fulfil. Alwoodley Reserves played out a 2-2 draw with newcomers Sky Blue, making sure their perilous start to the season didn’t result in relegation. The final spot in the drop zone will be filled by Dewsbury Rangers, one point from safety, or Medics who still have a game to play.